"...In mid-September, the IDF enforced a High Court of Justice order to destroy 250 structures built illegally by Palestinian squatters in the Jordan Valley. The High Court acted in accordance with the agreements signed between the Palestinians and Israel. Those agreements gave Israel sole control over planning and zoning in the Jordan Valley and throughout the area of Judea and Samaria defined in Area C.
"Five days after the IDF destroyed the illegal structures, Palestinian activists arrived at the site with tents. Their intention was to act in contempt of the law and the agreements the PLO signed with Israel, and to resettle the site. "The Palestinians did not come alone. They were accompanied by European diplomats. The diplomats were there to provide diplomatic cover to the Palestinians as they broke the law and breached the agreements PLO signed with the Israeli government. "This would have been bad enough, but in the event, one European diplomat, Marion Castaing, the cultural attache at the French Consulate in Jerusalem, decided that her job didn't end with providing diplomatic cover for lawbreakers. She joined them. She punched an Israeli border policeman in the face. "Rather than apologize to Israel for using European diplomats to support Palestinians engaged in criminal activity, and for Castaing's shocking violence against an Israeli soldier lawfully performing his duties, EU foreign policy chief Catherine Ashton attacked Israel. 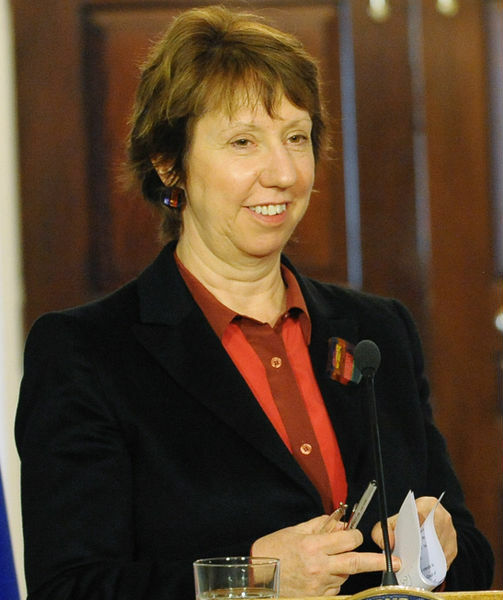 EU foreign policy chief Catherine Ashton. "'EU representatives have already contacted the Israeli authorities to demand an explanation and expressed their concern at the incident. The EU underlines the importance of unimpeded delivery of humanitarian assistance and the applicability of international humanitarian law in the occupied Palestinian territories,' Ashton said. "The EU's role in financing illegal Palestinian building efforts in the Jordan Valley is not unique. For some time, in contempt of Israeli law and the arrangements signed between Israel and the PLO, the EU has been financing illegal building by Arabs in Judea, Samaria and Jerusalem. "In recent months, there has been a palpable escalation of European hostility toward Israel..."
"Outrage" is a fairly apt description of what transpired here -- what continues to transpire. The Europeans are growing increasing blatant in their anti-Israel positions. There is nothing subtle about their behavior. And please note that they fall back upon allusions to "international humanitarian law" when criticizing Israel. That's the standard: Anyone, at any time, can refer to "international humanitarian law," but this in no way means that such law genuinely applies. "Consider," says Glick, "Europe's position on Israeli communities built beyond the 1949 armistice lines. Europe wrongly asserts that these communities are illegal. But even if they were right, Europe's behavior toward Israel would still make a mockery of its proclaimed devotion to international law. Europe has no problem, indeed it has actively supported settlements for citizens of belligerent occupying powers in areas ruled through occupation. As Profs. Avi Bell and Eugene Kantorovich from the Kohelet Policy Forum explained in a recent paper on the EU's guidelines, the EU supports settlements by occupying powers in Northern Cyprus, Abkazia and Western Sahara. In light of this, it is clear that the guidelines directed against Israel are inherently discriminatory. "The EU's supposed commitment to international law is similarly exposed as a sham by its willingness to turn a blind eye to the Palestinian Authority's diversion of EU monies to finance terrorism. Despite mountains of evidence accumulated over the past 13 years that aid is being siphoned off to finance terrorist attacks against Israel, the EU has refused to take action. And its refusal to act is itself a breach of international law." It is time, says Glick, to begin confronting the truth on these issues and stop giving a free pass to those "who distort the very meaning of international law while making empty proclamations of support for the cause of peace." This is information -- and a perspective -- that every supporter of Israel should have access to. Another running theme is that of Iran's race to become a nuclear power, and the refusal of the nations negotiating with Iran to put a stop to what is imminent. Perhaps at some time in the near future I'll be motivated to discuss details once again. But for me now it all seems so wearisome, so "been-there-done-that." The bottom line is that everything that is being discussed is a half-way measure that won't stop Iran. As PM Netanyahu continues to point out, nothing short of the dismantlement of Iran's nuclear development capability will work. The Iranian offer to stop enriching at higher levels is meaningless if the equipment that would permit them to do so is still in their possession: In a matter of weeks they could (would, as they wished) be up and running again. "...The remarkable thing about President Obama's diplomacy in the region is that it has come full circle—to the very beginning of his presidency. The promised 'opening' to Iran, the pass given to Bashar Assad's tyranny in Syria, the abdication of the American gains in Iraq and a reflexive unease with Israel—these were hallmarks of the new president's approach to foreign policy. "...True, the sanctions have had their own power, but they haven't stopped Iran from aiding the murderous Assad regime in Syria, or subsidizing Hezbollah in Beirut. And they will not dissuade this regime from its pursuit of nuclear weapons. In dictatorial regimes, the pain of sanctions is passed onto the underclass and the vulnerable. "...The gullibility of Mr. Obama's pursuit of an opening with Iran has unsettled America's allies in the region. In Jordan, Saudi Arabia and the United Arab Emirates there is a powerful feeling of abandonment. In Israel, there is the bitter realization that America's strongest ally in region is now made to look like the final holdout against a blissful era of compromise that will calm a turbulent region. A sound U.S. diplomatic course with Iran would never have run so far ahead of Israel's interests and of the region's moderate anti-Iranian Arab coalition." The last paragraph I cite above is significant on two counts: The news here is filled with reports of the severe disillusionment of Saudi Arabia -- the anger at Obama's failure to come through. "Saudi Arabia's warning that it will downgrade its relationship with the United States is based on a fear that President Barack Obama lacks both the mettle and the guile to confront mutual adversaries, and is instead handing them a strategic advantage. "Riyadh is locked in what it sees as a pivotal battle over the fate of the Middle East with its arch-rival Iran, a country it believes is meddling in the affairs of allies and seeking to build a nuclear bomb, charges Tehran denies. "The kingdom's intelligence chief, Prince Bandar bin Sultan, has told European diplomats that Riyadh is contemplating a 'major shift' away from the United States over Washington's policies on a host of issues including Syria." And Ajami is on the mark, indeed, with the fact that here in Israel, where we get it right, we deeply resent being represented as a stumbling block to a peaceful settlement with Iran, a "warmonger," facing down the US's "peaceful" approach. David Albright, president of the Institute for Science and International Security and a former inspector with the IAEA, has released a new assessment estimating that "Iran could produce enough weapons-grade uranium to build a nuclear bomb in as little as a month. Israeli assessments (roughly, "months away") are much closer to the Albright estimate than to what Obama is gambling on. Obama is playing with fire of the most dangerous and lethal sort. The heart of the matter is the question of what Netanyahu will finally decide to do, and when -- after all his warnings are ignored and the world sails blithely towards a nuclear Iran. "I supported [Netanyahu and Barak] on the notion that if we come to the fork in the road [on Iran], where we have to choose between very tough alternatives—the ‘bomb’ or the ‘bombing’—I’m with the prime minister, for the bombing." "Israel doesn’t need America on D-Day. It can do it alone. It even can cope with the day after, but it does need the United States for the decade after. "[To those who say Israel cannot do it] I say that they ignore history. The same people also thought that we couldn’t destroy the Arab air forces in ‘67. They thought we couldn’t make it to Entebbe and free the hostages in 1976. They thought it was impossible to strike the reactor in Iraq. They thought we couldn’t destroy the Syrian air defenses in the Bekaa Valley in 1982. There’s a lot they thought Israel couldn’t do." Yadlin is confident that Israel can do it. Period. "It is doable...My confidence level is quite high. We have been building the force and practicing for this day for years." He then addressed the issue of probability of success -- with that probability dropping as Iran does more to secure its facilities. Right now he thinks the probability is still quite high -- 95% -- but that indeed it will be dropping. "The prime minister is not bluffing. It is the main issue he cares about. He thinks that stopping Iran from acquiring nuclear weapons is the most important issue for the future of the State of Israel. And he hasn’t changed." Technorati Tag: Israel and EU and Iran and Catherine Ashton.